TROT TROT TROT!! This spectacular looking mare has the trot everyone is looking for. Tons of snappy hock action balances her strong elevation and round rolling movement in the front. She really is poetry in motion. Paint Thinner is an honest 16 hands, has a strong body, beautiful long thin neck, great hinge, nice head with a big eye and perfect hooky ears. She has had lots of ground work and is ready for saddle training. When you see her in the flesh, snorting, tail curled over her back, trotting across the arena, this upright beautiful mare is an awesome sight. 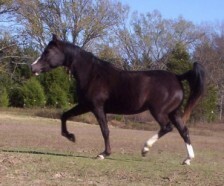 With her perfect angles at the trot her potential may lie in Dressage. Come see her and decide for yourself.